For real-life visual demonstrations / explanations of football terms, click on the YouTube / Wikipedia links within the story (opens in new tab). 0″ KICK-OFF: Team STM starts first. 3″ SHOT OFF TARGET (STM): Great through ball from Claudia Monty! 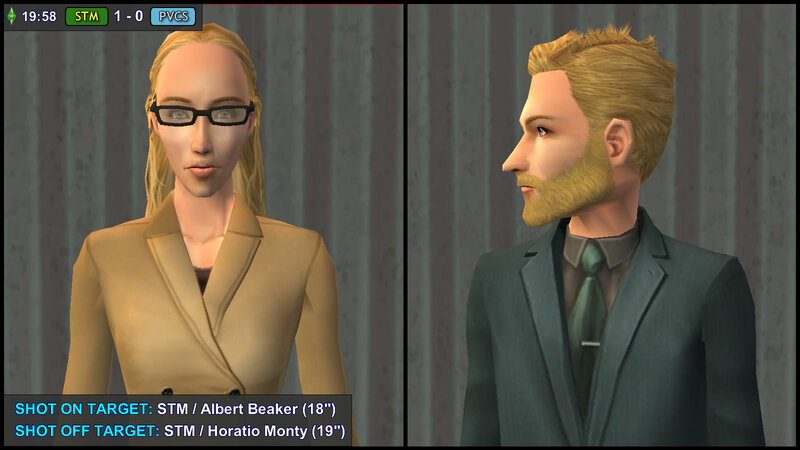 Straight to Horatio Monty… bad touch! AldoHyde (AH): Mark my words! The next generation of footballers is starting early this era! 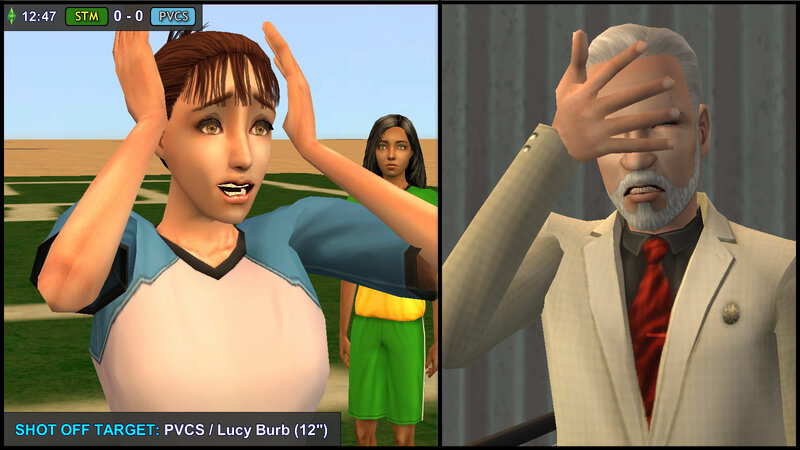 Sims2Player (S2P): Yeah, Claudia Monty is only 13, and is already showing promising skill! 8″ (STM): Chauncey Specter wins the ball from Hal Capp, and outruns the PVCS defense! He crosses the ball, which ends up near Tank Grunt… but Tank is dispossessed by Dirk Dreamer, and the PVCS defender clears the ball upfield. It’s still early in the game, thought STM Manager General Grunt. It’s great that Tank is in the right place at the right time. He hopes that Tank would not pick up any Yellow Cards, so as not to be forced to sub off the only Grunt on the field. 12″ SHOT OFF TARGET (PVCS): The ball is in the box of the STM penalty area! Fanciful touch, and great dribble from Lucy Burb! She must score this time! S2P: What is she doing? She did a rabona, but it went wide! Why didn’t she just finish it normally at the top left corner? She just gave away a huge chance! 15″ GOAL (STM) 1-0: Vivian Curious! She just shot from FAR outside the penalty area! In the audience, Lazlo Curious does a happy dance to celebrate his niece’s goal. Vidcund and Pascal simply stand up to cheer. 18″ SHOT ON TARGET (STM): Chauncey Specter outruns 2 PVCS players on his left flank. He crosses the ball to Albert Beaker, who fires on target… but Juan Caliente pushes it away! 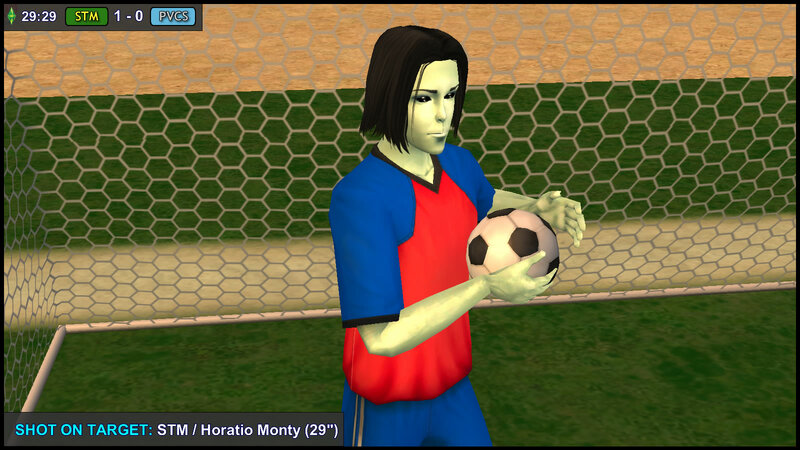 19” SHOT OFF TARGET (STM): The rebound reaches Horatio Monty, who heads it over the crossbar! Kent takes a glance at his sister. Maybe he should talk to her openly. But about what? Their respective sons being strikers for opposing teams? He shoots, and it’s caught by the keeper! S2P: Unbelievable, what a reflex. Some fans even cheered because they thought Ben Monty wasn’t going to reach the ball, but he just jumps outta nowhere! AH: VFL Simburg, scout this talent immediately! General Grunt nods in approval. How he wishes that his son, Buck, the substitute goalkeeper, had no issues with fitness or stamina. But Ben Monty is in excellent form, so it was correct to let Kent’s nephew start the match instead. 25″ SHOT OFF TARGET (PVCS): Tybalt Capp out of nowhere!!!! Goal post!!!!!!! 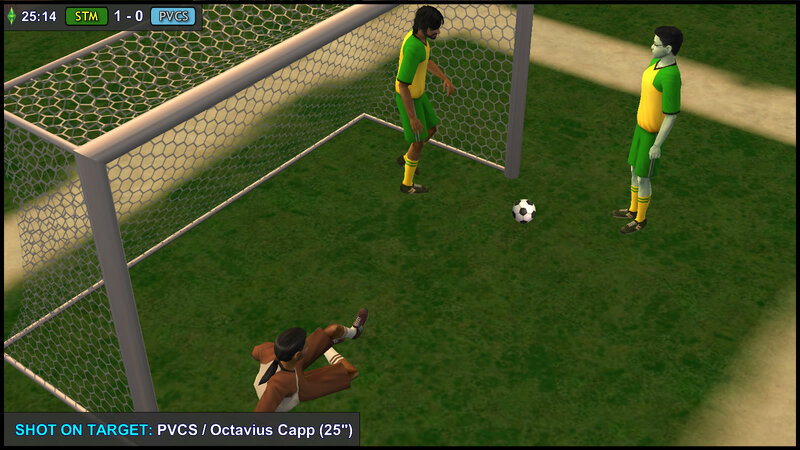 25″ SHOT ON TARGET (PVCS): Octavius Capp with the rebound? Goal!!!!!! 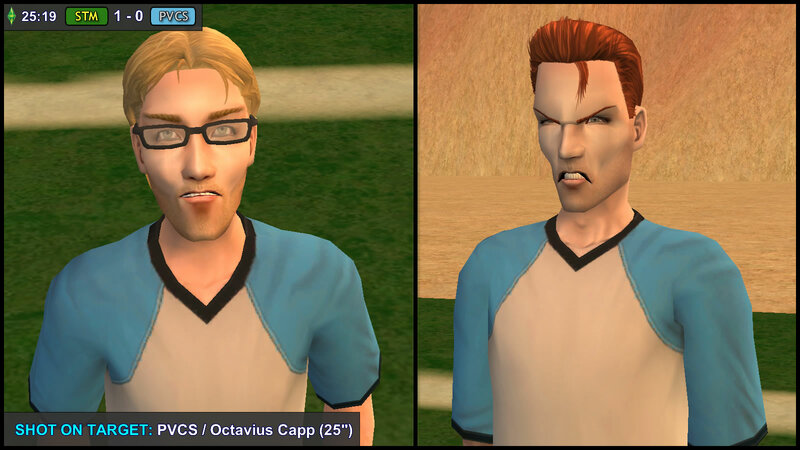 Octavius Capp!!! 1-1!! No, wait… The referee blows the whistle. What did the officials see? Octavius: Don’t be so optimistic, Tybalt. They’re good. Tybalt: Not when compared to us. They should never have defeated us the last time. Tybalt: Shut up, you weren’t there. Octavius: Alright, Tybalt. We’ll try to do our best instead of losing focus. That’s how they could possibly win. Kent: Does your son like Tybalt? Regan: (pleasantly surprised by Kent speaking directly to her) Why? Regan: Octavius is not comfortable with some of the things Tybalt did in the past. Watcher knows why Goneril is trying to influence him to be like Tybalt, but honestly, I’d prefer Octavius to be the sensible boy he is now. Kent: I see. I was never fond of Tybalt either. Guess I’m not the only one. 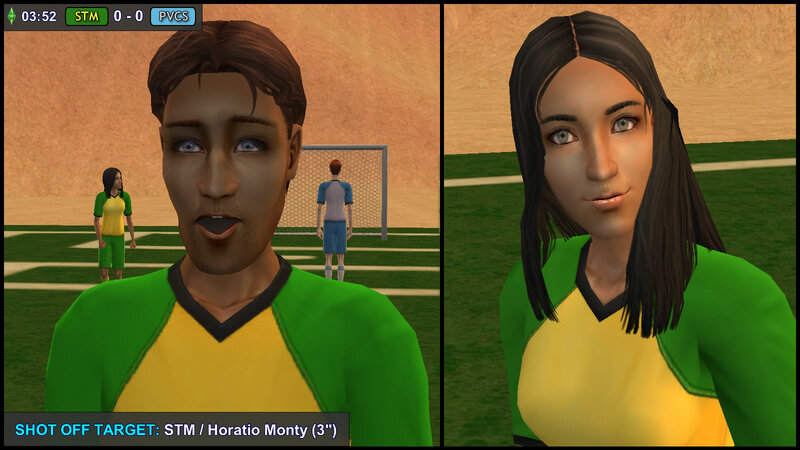 29″ SHOT ON TARGET (STM): Claudia Monty lobs the ball to Horatio Monty, who fires on target. However, Juan Caliente just gets his fingertips on the ball, and denies the goal. Regan: Your kids work well together! Regan: That’s good! Dad didn’t, which was a pity. 30” INJURY (PVCS & STM): Hermia Summerdream clashes with Isabel Loner. Both players are down. Hermia’s brother Tybalt, and Isabel’s cousin Albert, look concerned. But both Hermia and Isabel are ok after some quick treatment. 33″: Albert Beaker breaks through the PVCS defense, after receiving a pass from Johnny Smith… but Juan Caliente storms into Albert, and grabs the ball. No cards or penalty. But they glare at each other. 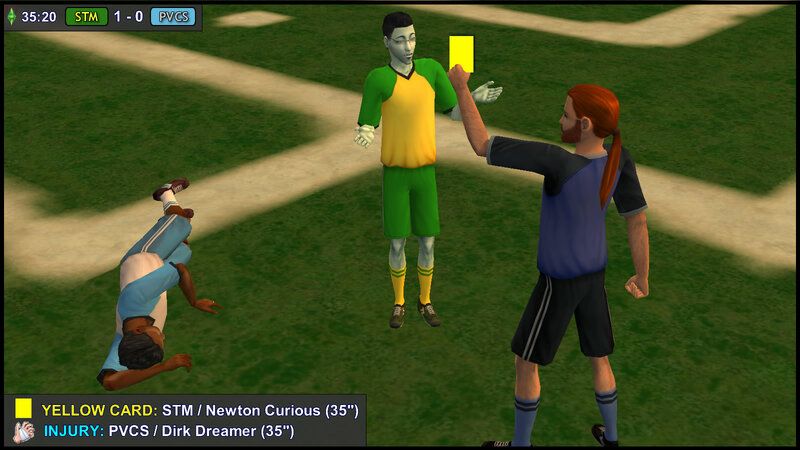 35″ YELLOW CARD (STM): Newton Curious’ poorly-timed tackle injures Dirk Dreamer. 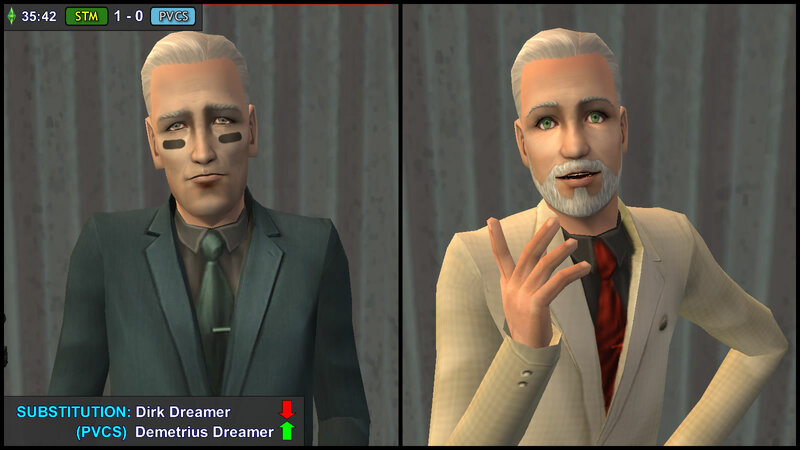 Gen Grunt: Demetrius Dreamer, is that your grandson? Daniel: Yes he is! What do you think of him? Daniel: What do you mean? “Any Summerdreams?”, to which Bianca’s quick reply is “No”. (**) A “wall” of players from the defending team. In this case: STM’s Tank Grunt, Vivian Curious & Johnny Smith. 41″ GOAL (PVCS) 1-1: Ariel Capp with the header!!! GOAL!!!!! Her father, Albany Capp cheers and claps the loudest in the PVCS crowd. But her mother, Goneril, only manages a thin smile. 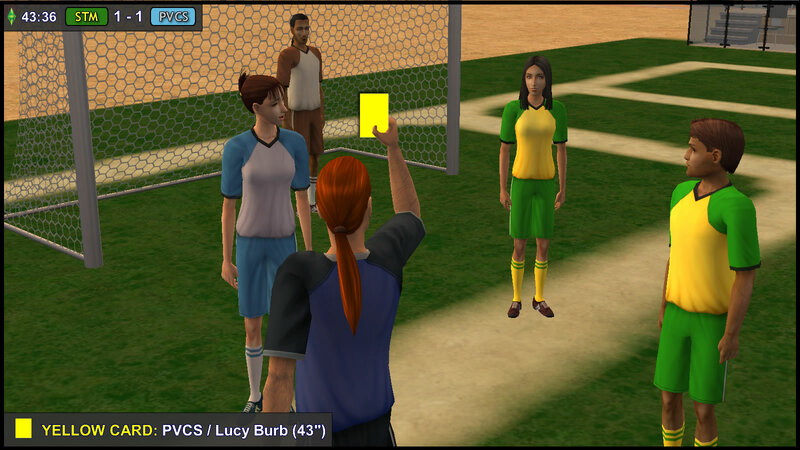 43″ YELLOW CARD (PVCS): Lucy Burb down with an ankle injury. But it seems she can just walk normally afterwards. Yellow Card for feigned injury. Regan Capp is suddenly struck by the irony of Kent Monty’s situation: That upon marriage, he chose to take a new surname, and now he’s managing the team associated with that surname. 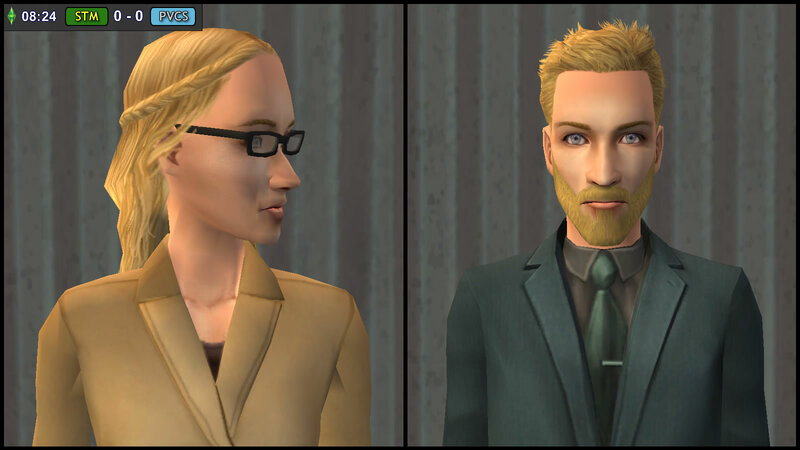 While Kent will be quick to deny any resemblance he has to their father, Consort Capp, Regan thinks that Kent resembles Consort, at least in this particular way. 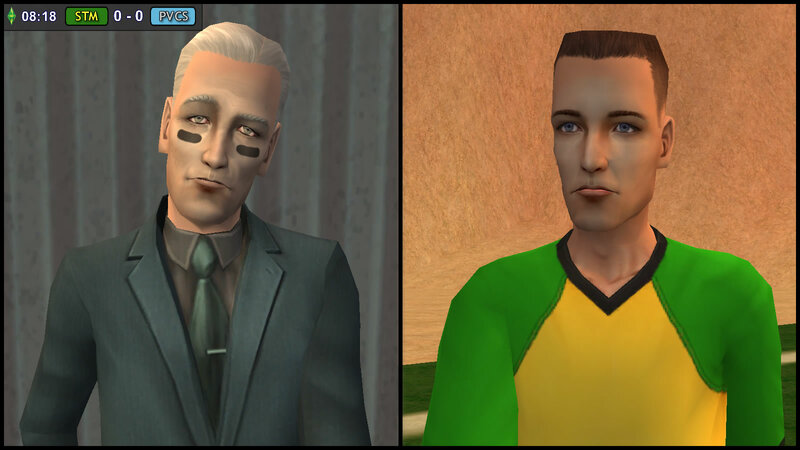 “Like Father, like son”… Kent may know this in his heart, but would not like to admit this publicly. So Regan wouldn’t be the one to point this out to him. 45” OFFSIDE (PVCS): Tybalt Capp shoots wide, but it doesn’t matter, as he was already flagged offside. Tybalt: What? Who said that? Oh, there you are, little octopus. 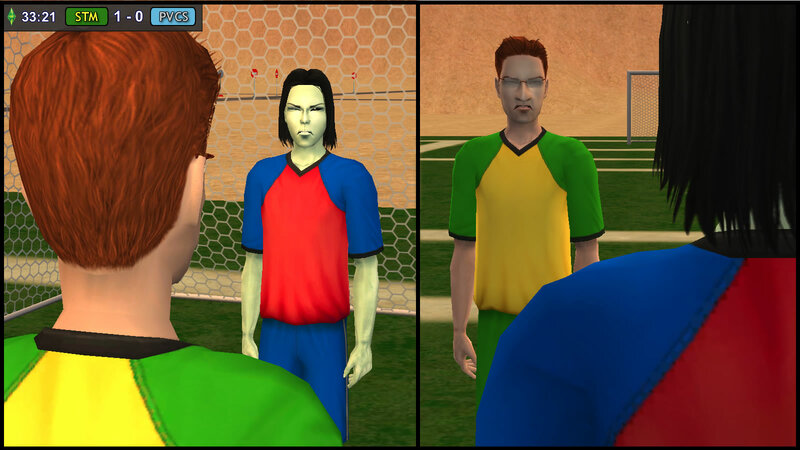 Octavius: It doesn’t matter that you’re offside, it can happen to anybody! Octavius: Don’t do it, Tybalt… not like what you did to that waiter during our family dinner in 2031, or that guy in the park who threw a pebble at you 2 months ago, that didn’t even hit you. 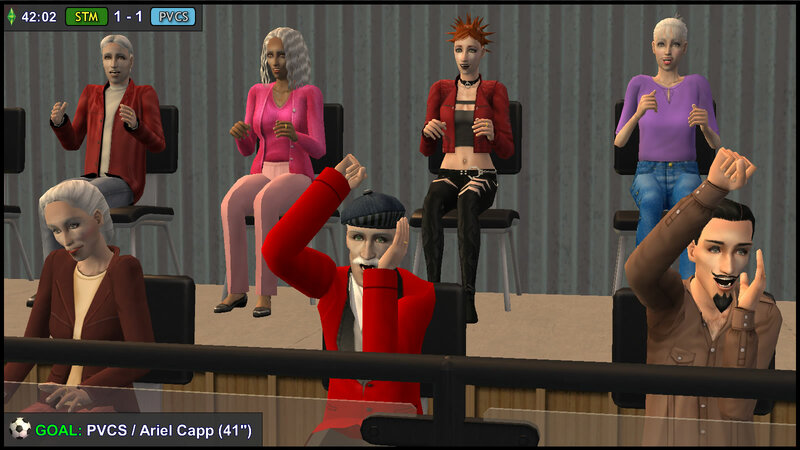 S2P: And the referee blows the whistle! It’s 1-1, and the players are going for their Half-Time break. AH: It’s been an awesome match! We saw some great chances in this 1st half, where the new stars really shone! Pity Dirk Dreamer got injured. Seems like he needs to go to the hospital. S2P: Well, to be honest, I think he’s feeling better than Lucy Burb at the moment! AH: Definitely! What’s up with LB7 today? 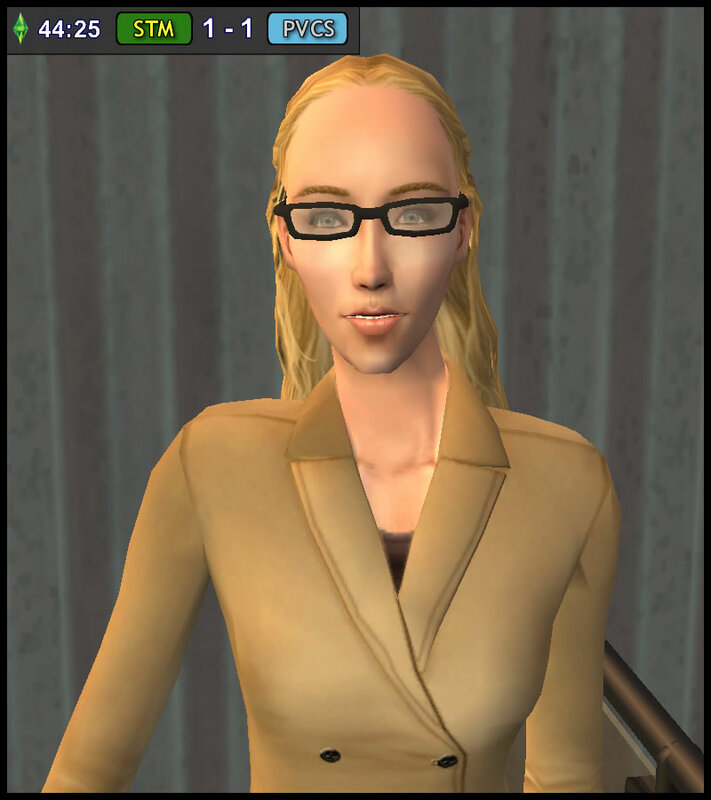 Is she here to help her team, or to compile a bloopers reel? AH: Yeah, and I hope Dirk’s injury isn’t too serious. Meanwhile, will we see more goals in the 2nd Half, after both sides refresh themselves and reconsider their strategy during the Half-Time Break? 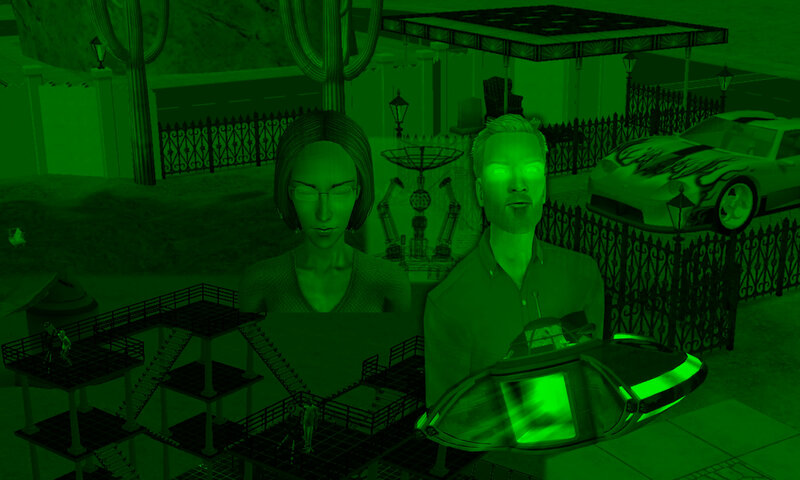 This is AldoHyde and Sims2Player live at Hyde Dynamic Arena. Half-Time score: STM 1, PVCS 1. Will the conflicts in the 1st Half escalate during the HT Break? What sort of “negotiations” may take place in these crucial 15 minutes?